Landing a spot in IMA's Top Ten Newcomers list is all about making an indelible impression which lasts beyond the final turn on the runway. For Elite Model Amsterdam newcomer Essie Glassman the Spring/Summer 2016 season was a masterful exercise in the power of a quality over quantity game plan. The nineteen year old flaxen blond with pale alabaster skin debuted as a Calvin Klein exclusive drawing collective gasps of excitement from showgoers due to her uncanny likeness to iconic top model Gemma Ward. Glassman's 179 cm elegant frame stood out from the masses throughout her selective appearances at Burberry Prorsum, Antonion Berardi, Giamba, Phillip Plein, Antonio Marras, Krizia, Moncler Gamme Rouge, and, Alexander McQueen. Scouted at the age of fourteen, Glassman has been modelled intermittently while completing her school studies and following a year of intensive development by Elite Models Amsterdam was unleashed at the Spring/Summer 2016 collections. 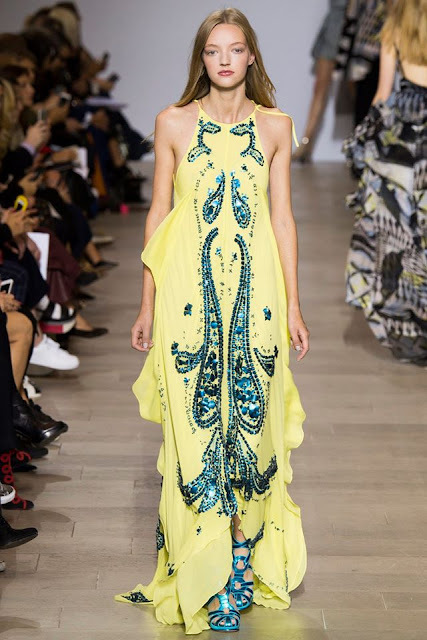 With her wide-set baby blues, golden flowing hair and elusive star quality, Glassman has left designers, casting directors, and model aficionados hankering for more.